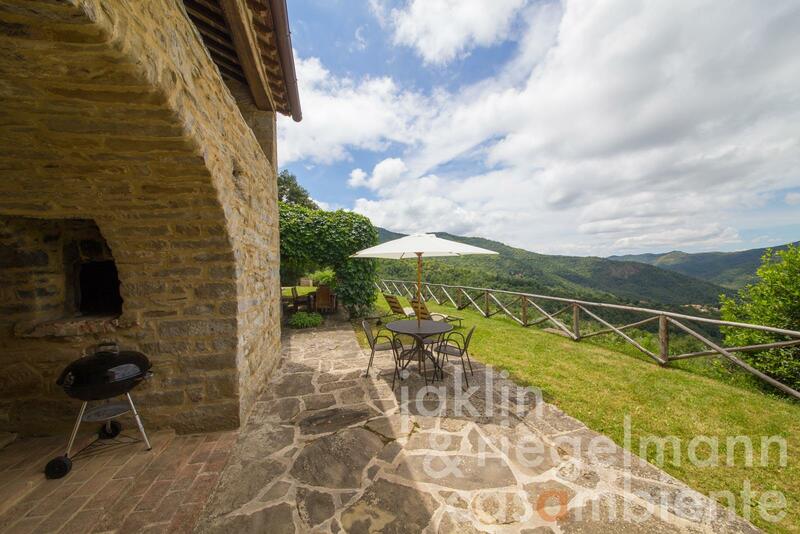 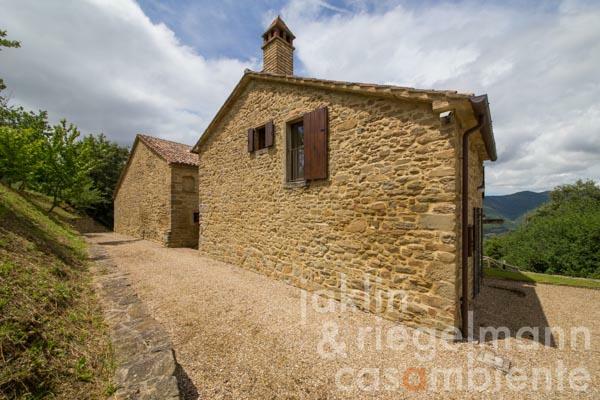 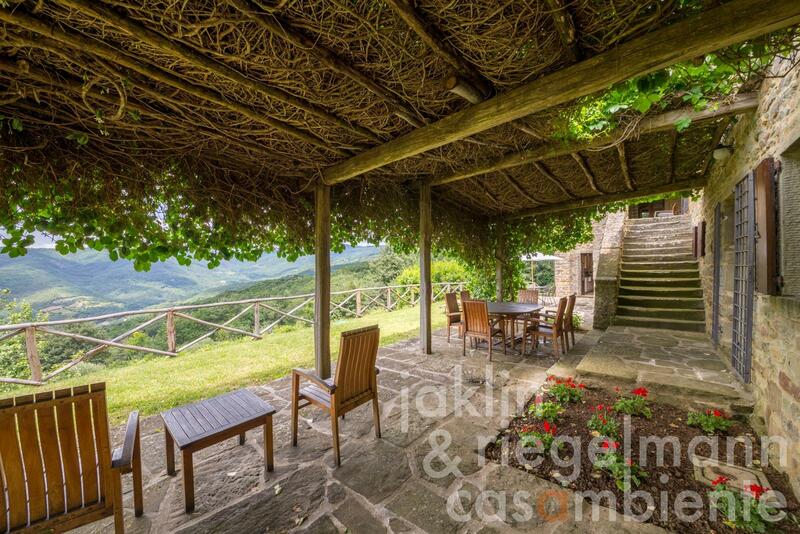 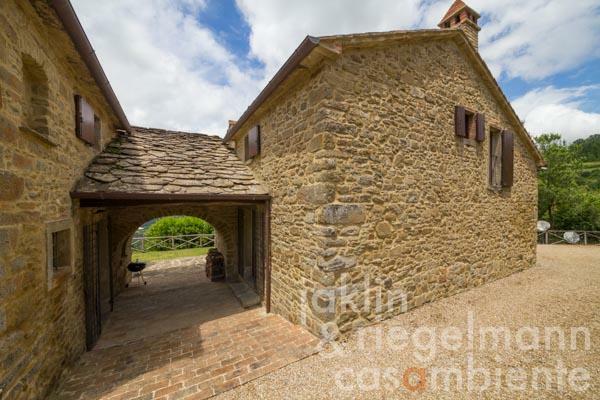 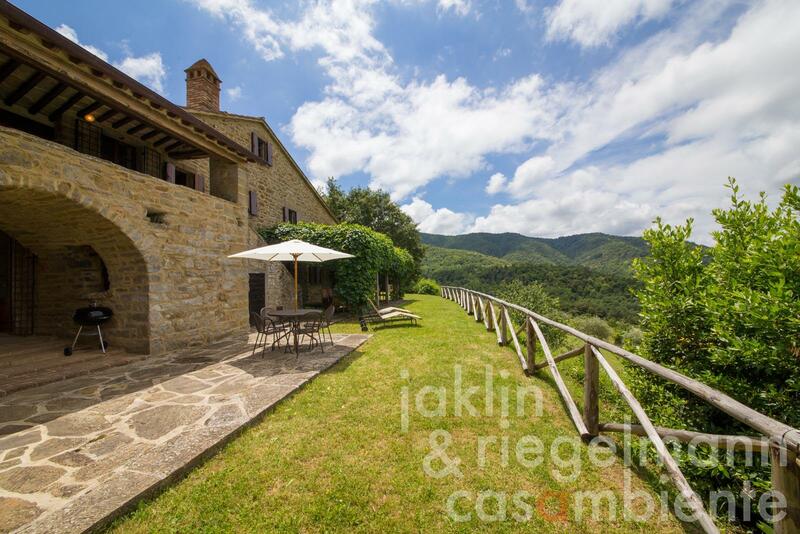 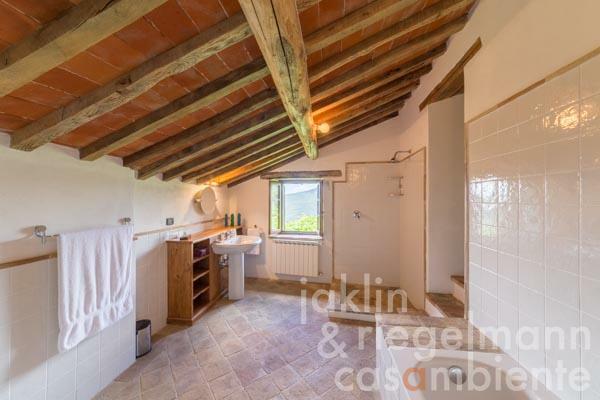 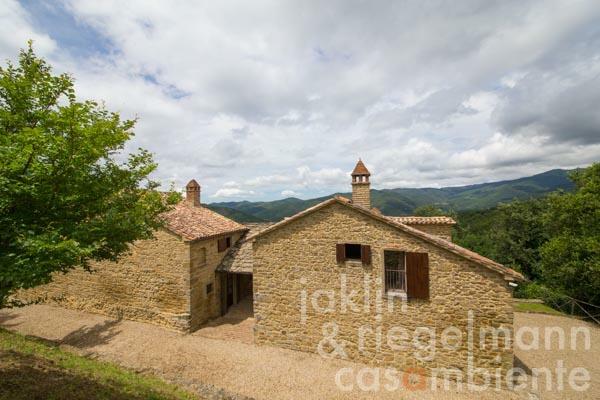 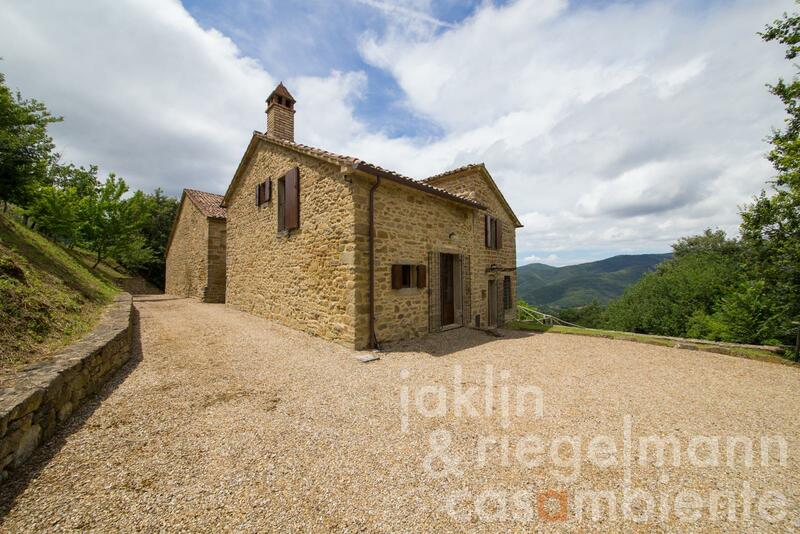 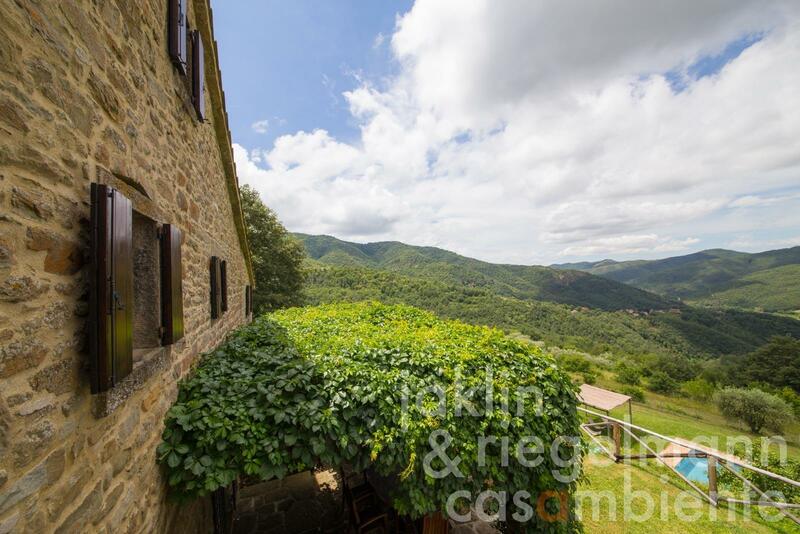 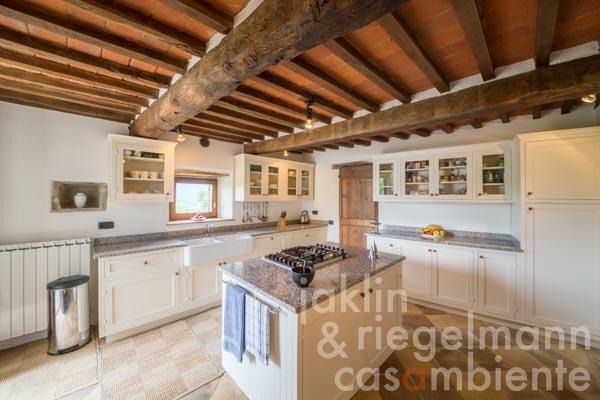 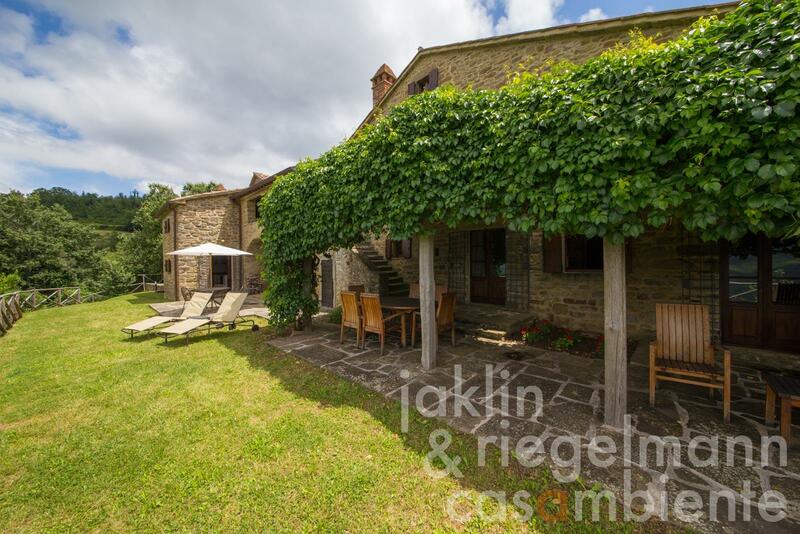 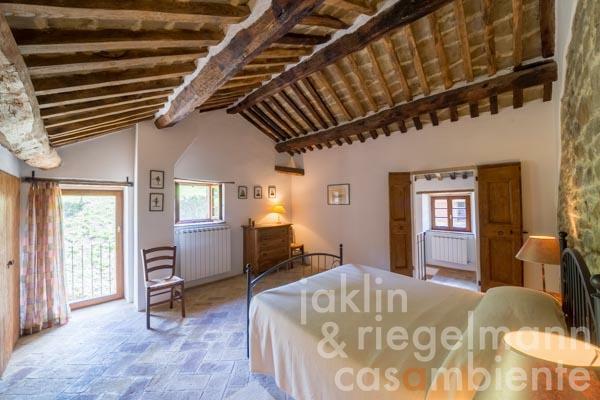 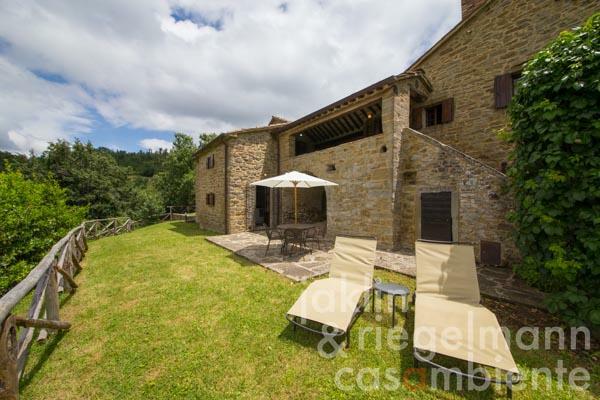 This traditional Tuscan stone farmhouse for sale is located in the beautiful countryside between Cortona and the Umbrian border. 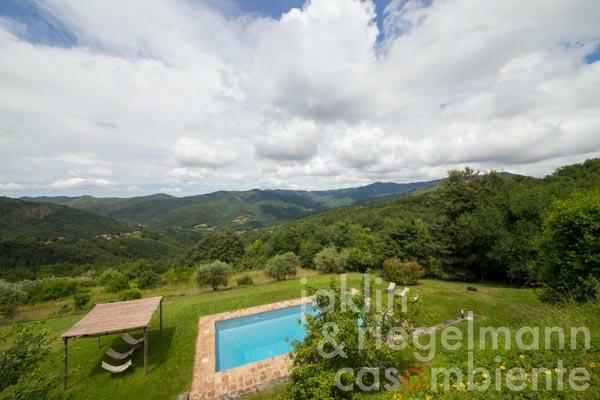 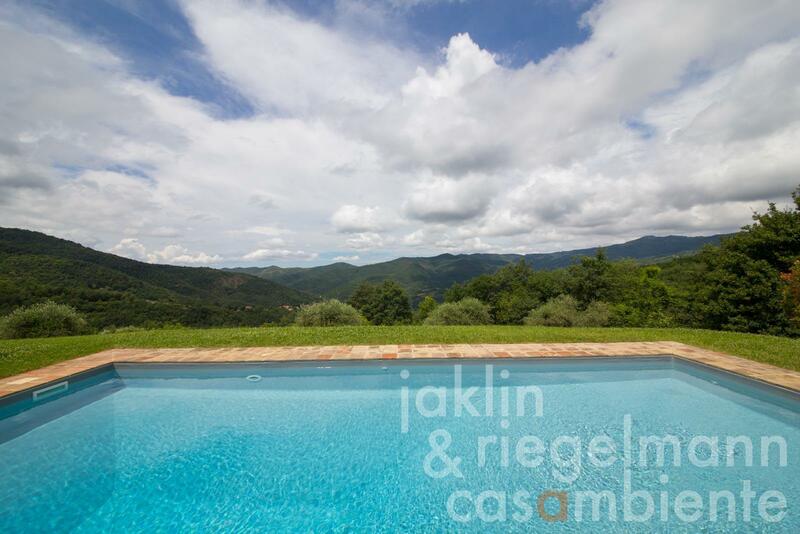 It is set on a hillside in a secluded south-west-facing position with stunning panoramic views. 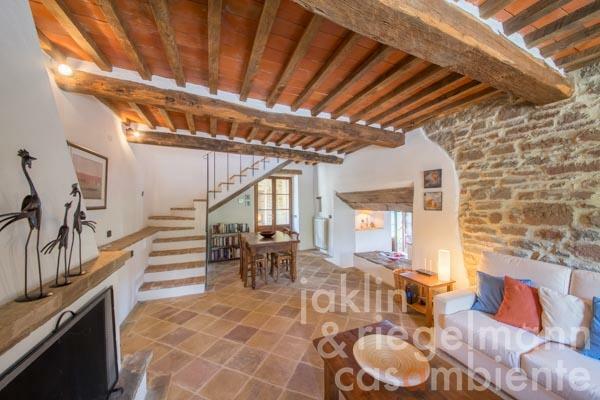 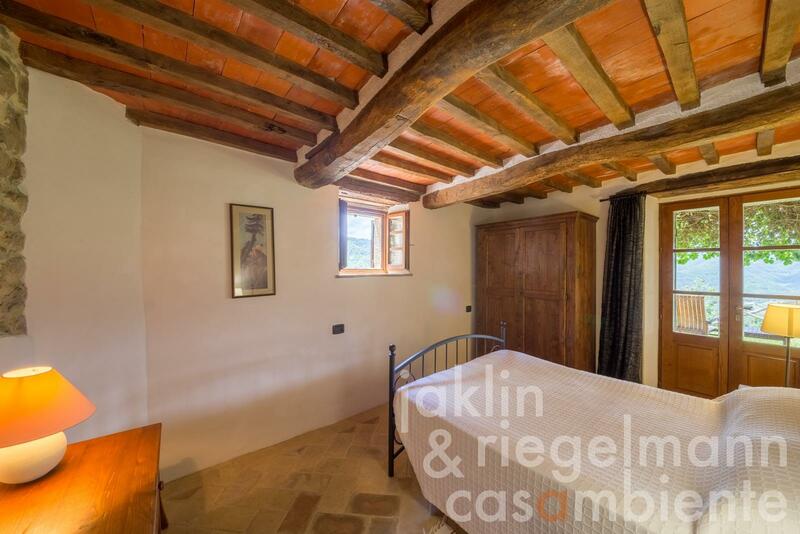 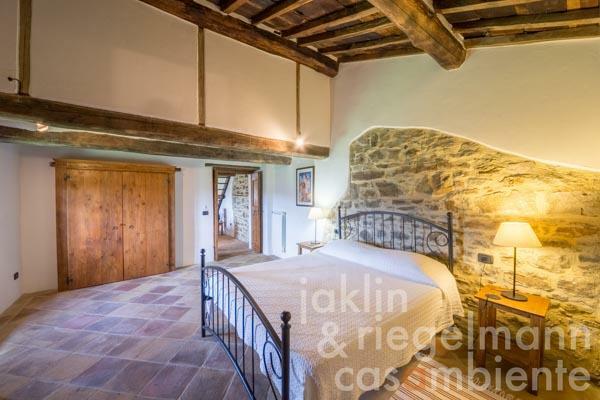 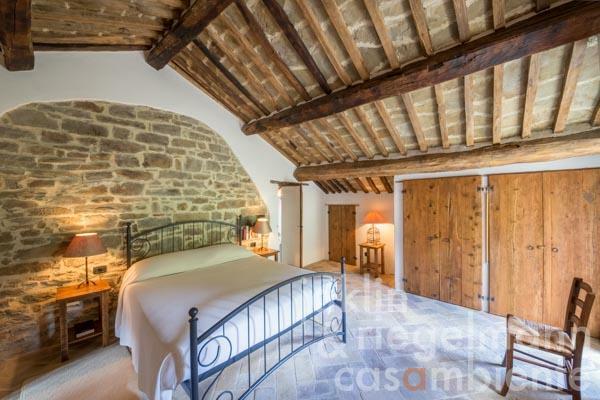 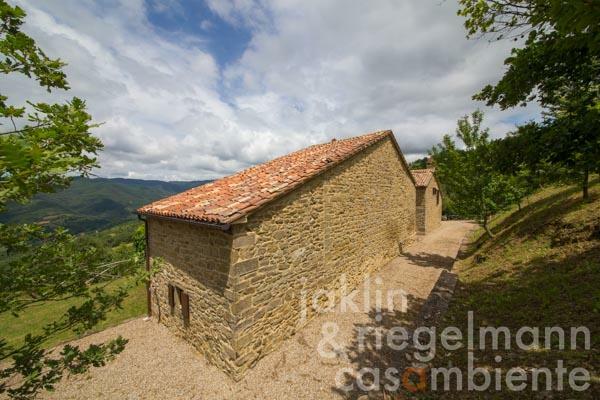 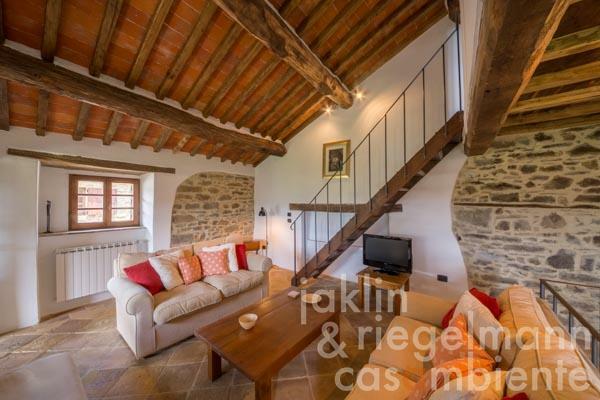 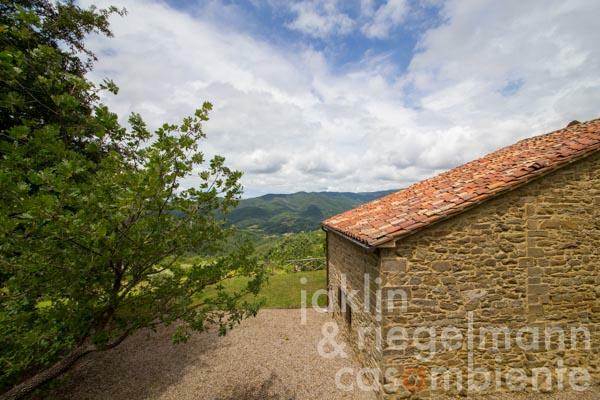 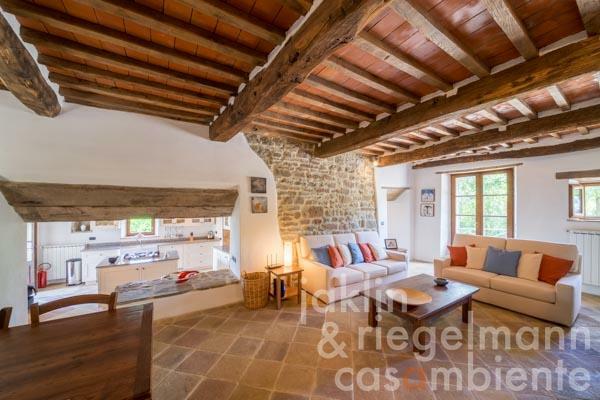 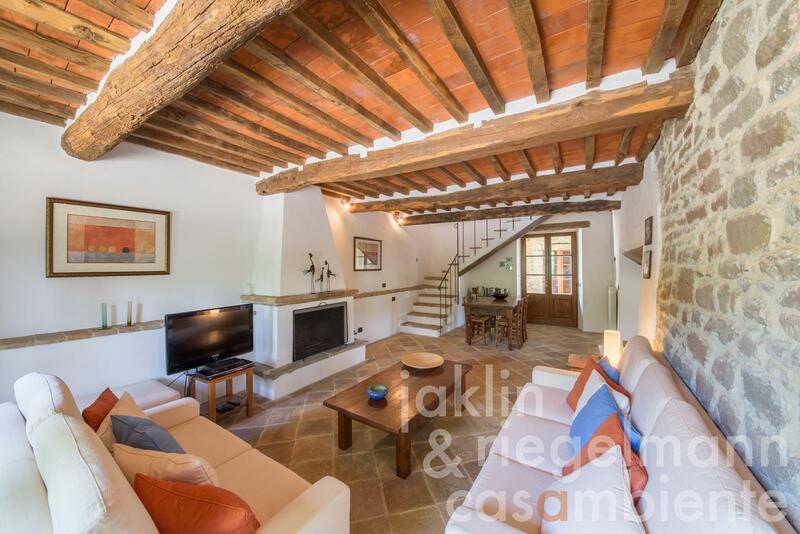 The property has been restored to the highest standards and is composed of two fully independent stone houses connected by a covered loggia. 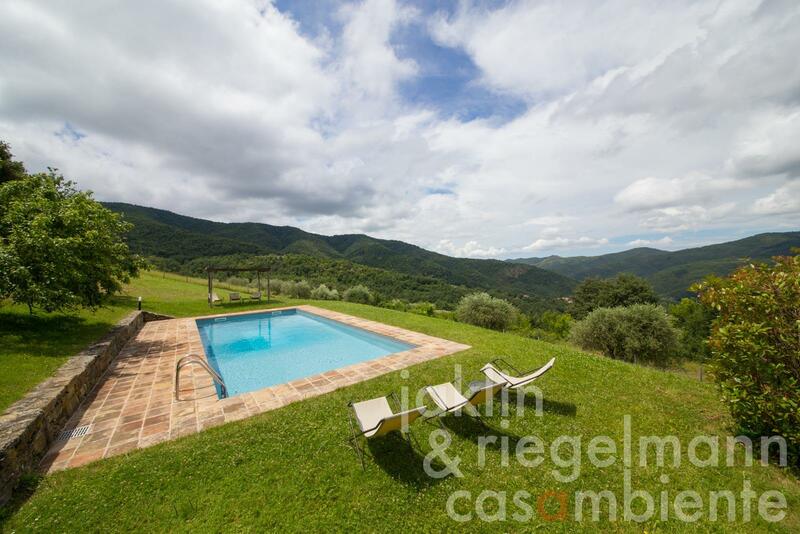 Below the terrace in front of the houses there is a 10 x 5 metre swimming pool, which also enjoys the stunning view. The smaller house (approx. 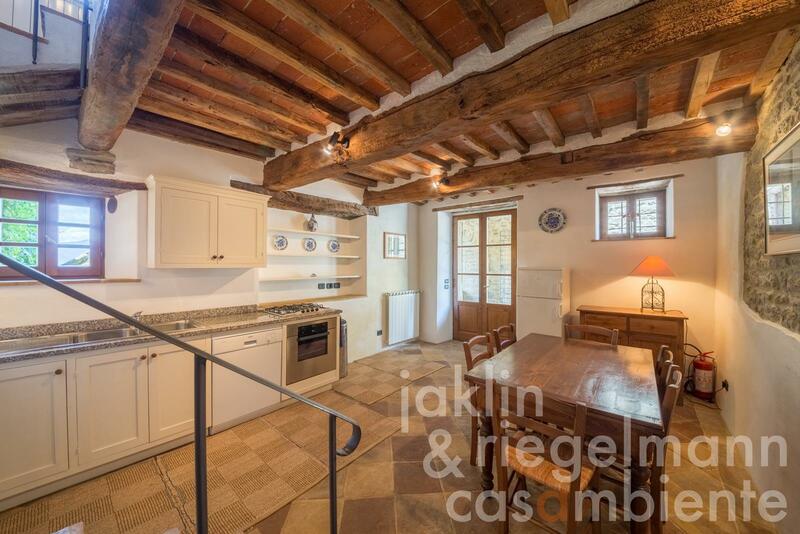 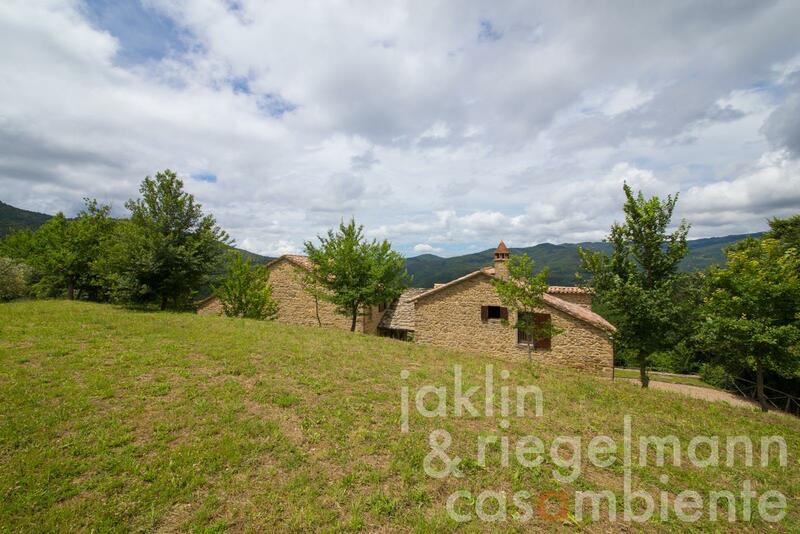 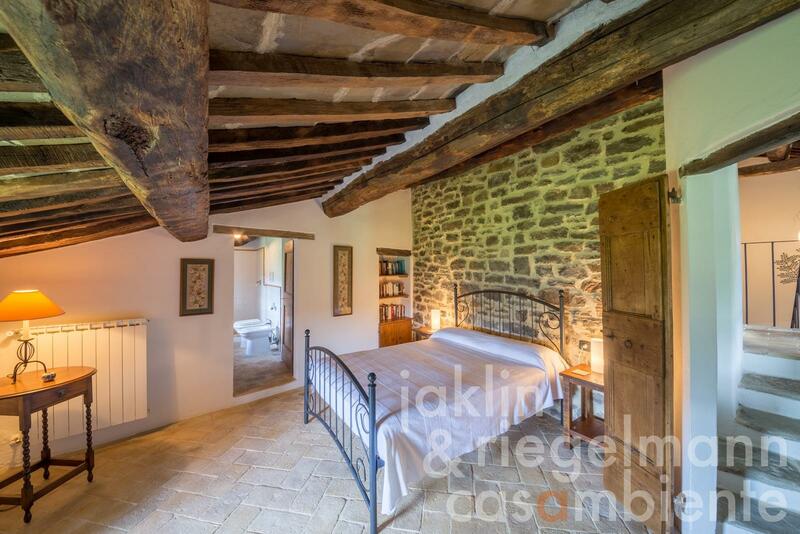 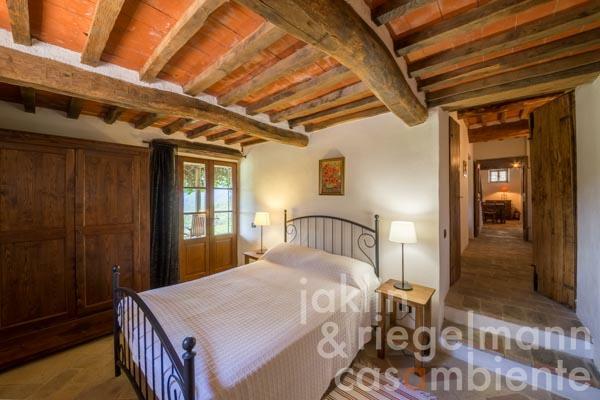 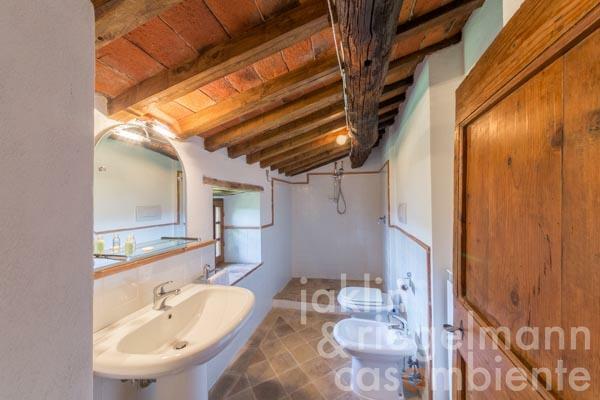 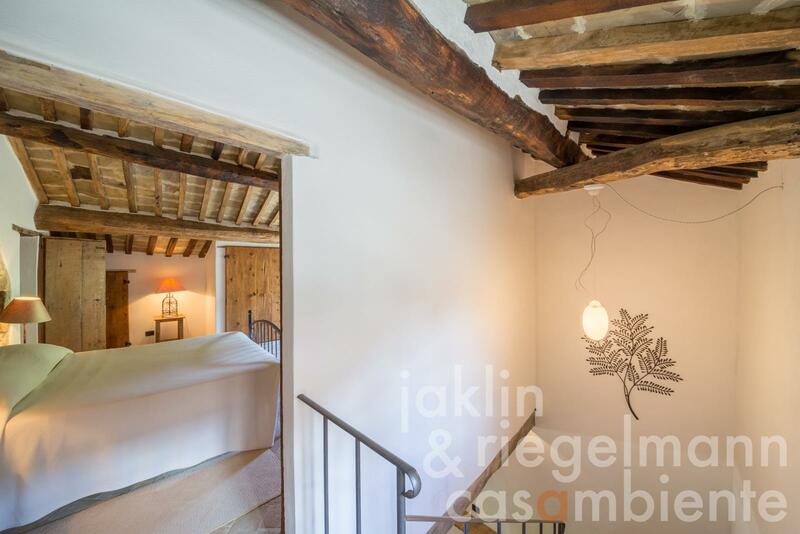 120 m²) is used by the owners as their private home and has been restored with attention to detail, preserving the original character of the house but implementing modern comfort and style. 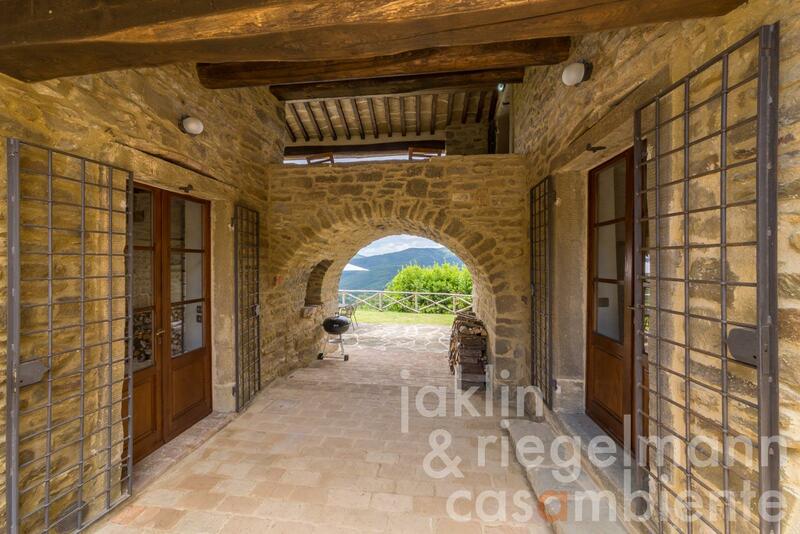 From the loggia one enters into an inviting living/dining room with fireplace. Three steps down lead to a large fully fitted kitchen with cooking island and separate pantry/laundry room. 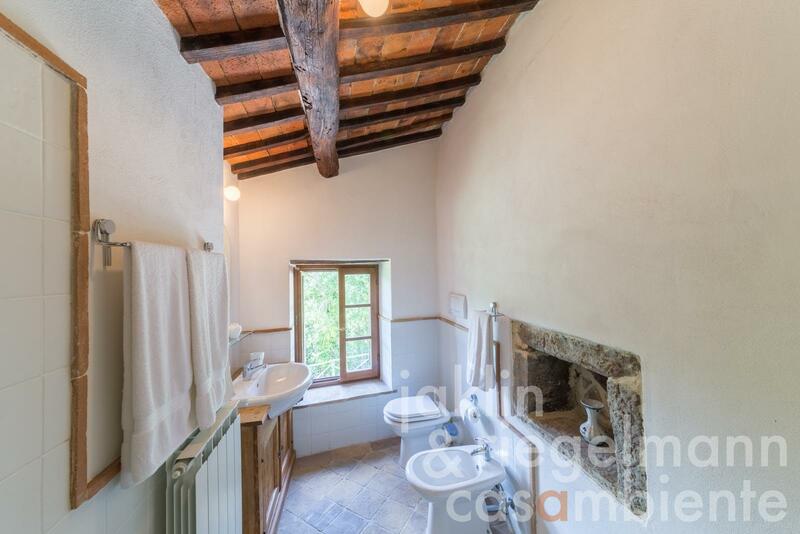 On the ground floor there are also a guest bathroom and boiler room. 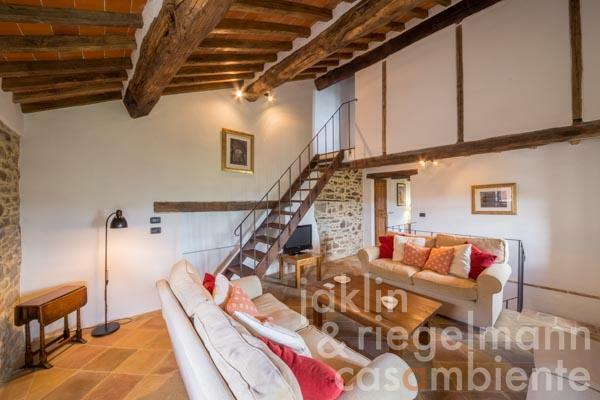 From the living room, stairs lead to the first floor with two bedrooms, each with built-in cupboards and en-suite bathroom. 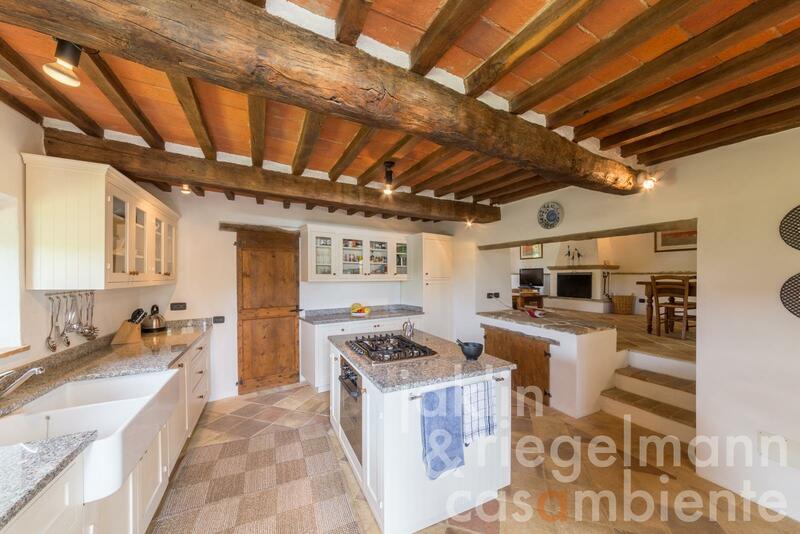 The larger house (approx. 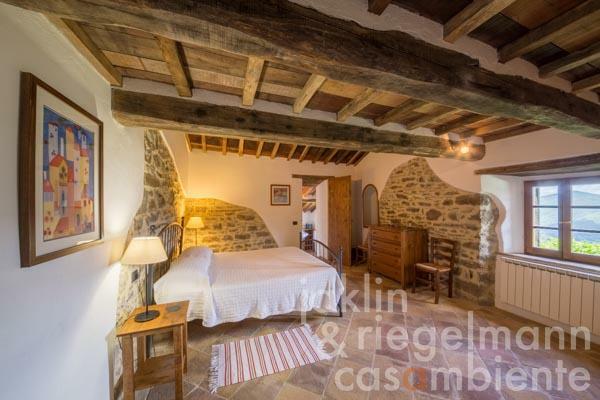 180 m²) is successfully rented out to holidays guests but is also ideal to accommodate family and friends. 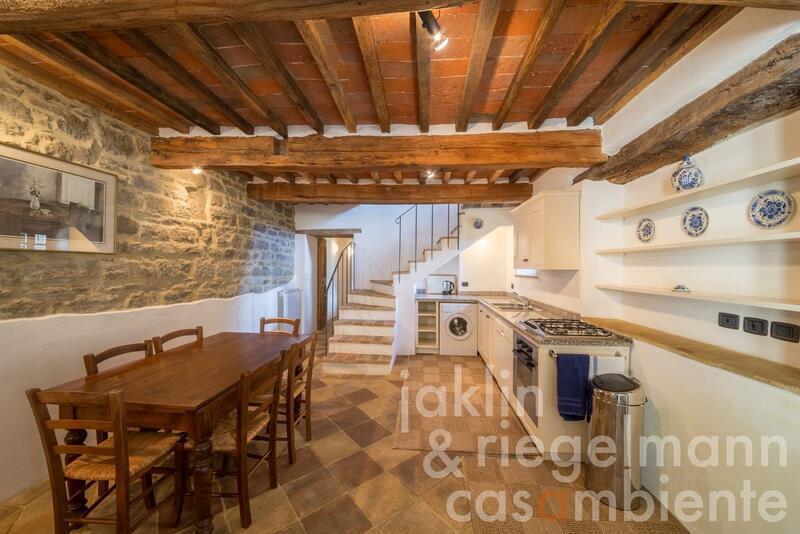 It is spread over three floors with, on the ground floor, a comfortable kitchen/dining room, two bedrooms (one double and one single), both with French windows which open on to the vine covered terrace and a shared bathroom. Stairs lead to the first floor with the master bedroom with en-suite bathroom and a cosy lounge with access to a loggia, the perfect place from which to watch the setting sun. 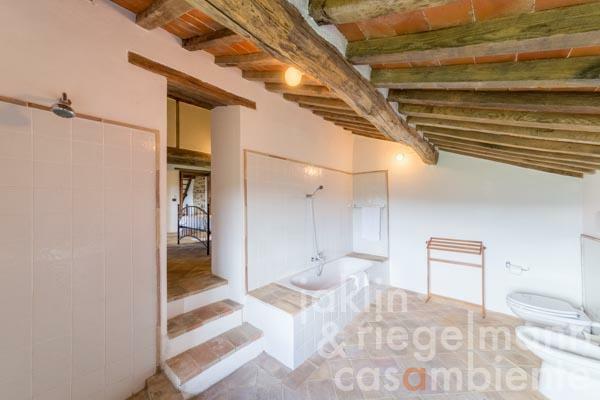 From here an external staircase leads to the ground floor. The attic room on the upper floor can be used as an additional bedroom and has a small bathroom. 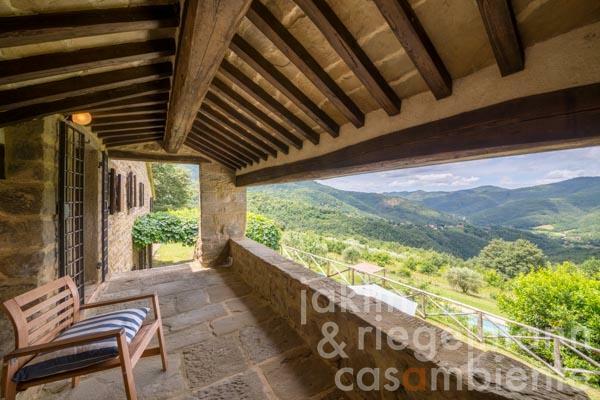 The house is situated in a hilly, wooded area of great beauty. 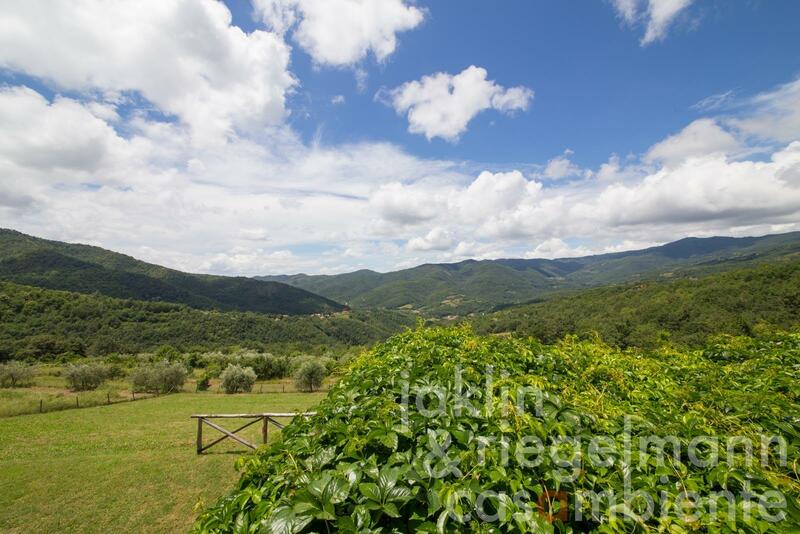 There are wonderful walks in the immediate area and a rich variety of wildlife, including wild boar, deer, pine martens and birds of prey. The road to Cortona winds up and over a range of hills and offers wonderful views of Lake Trasimeno. Cortona is a gem of a medieval Tuscan hill town with interesting Etruscan remains and has many good restaurants. 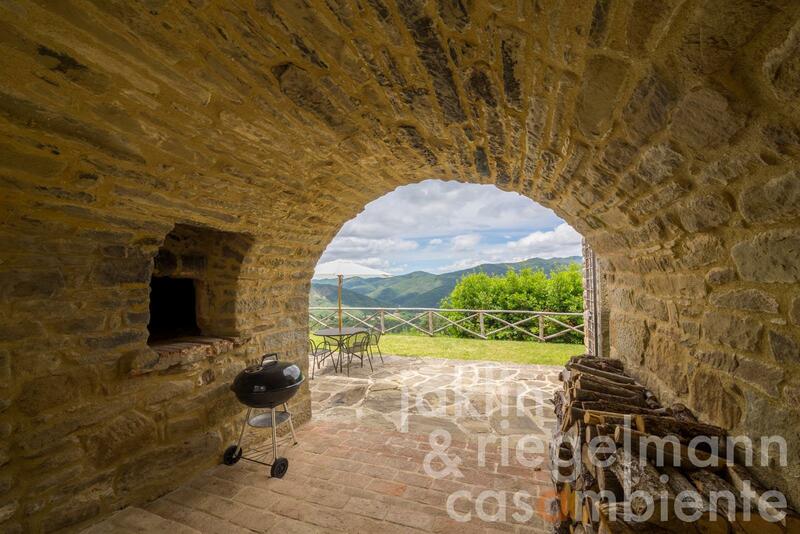 In the other direction, the road follows the valley into Umbria and to the small town of Trestina, which has supermarkets and several other shops, as well as restaurants. There is also a supermarket in a small village, some 15 minutes away. The closest restaurant is about 10 minutes by car. 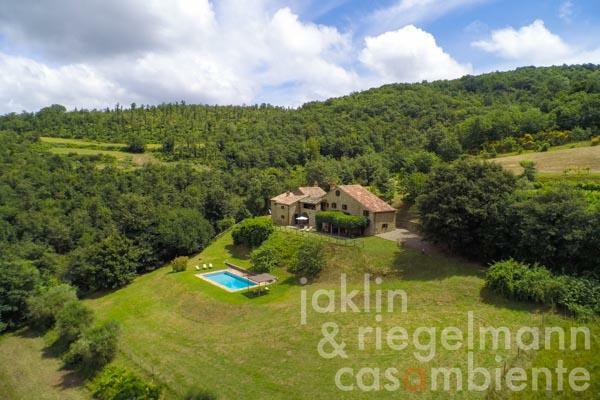 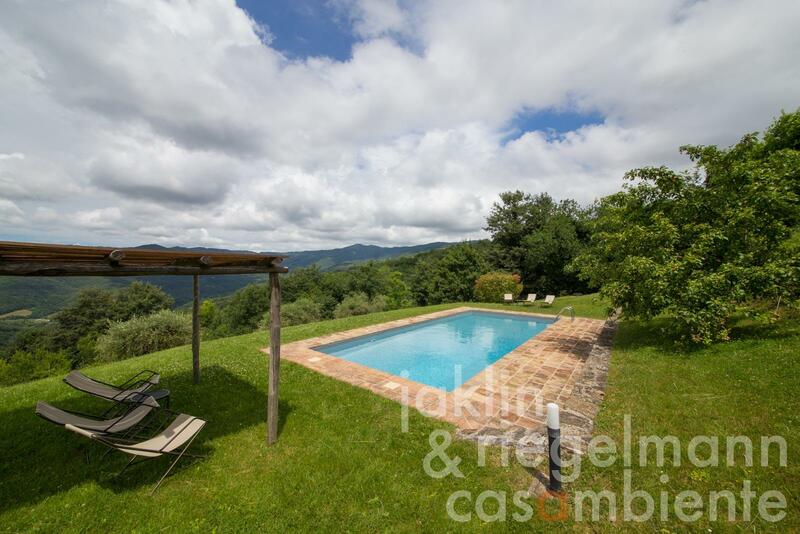 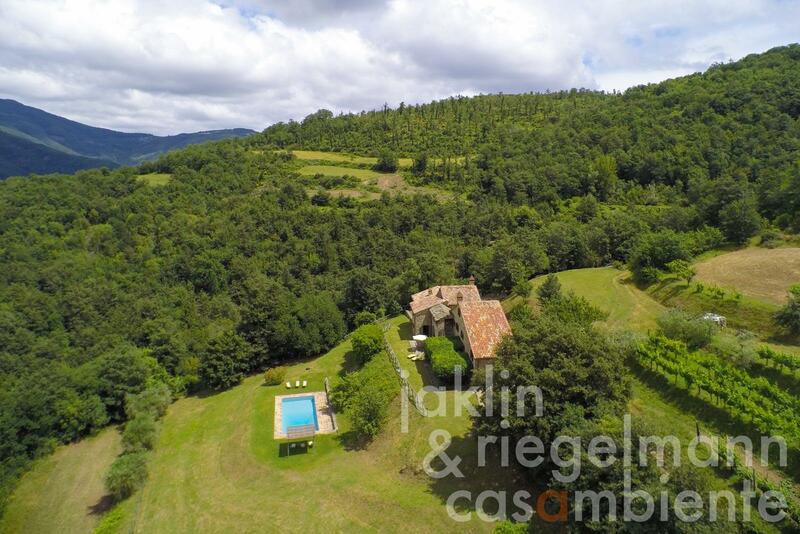 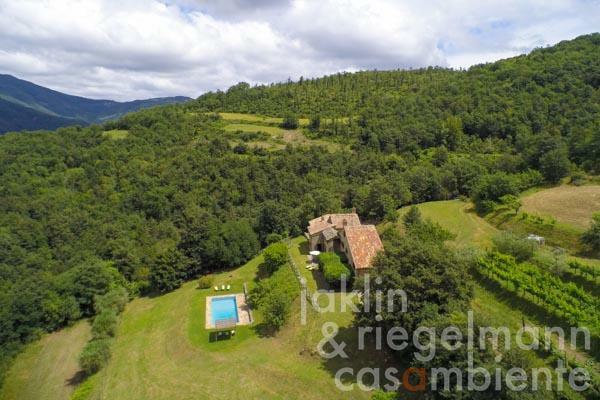 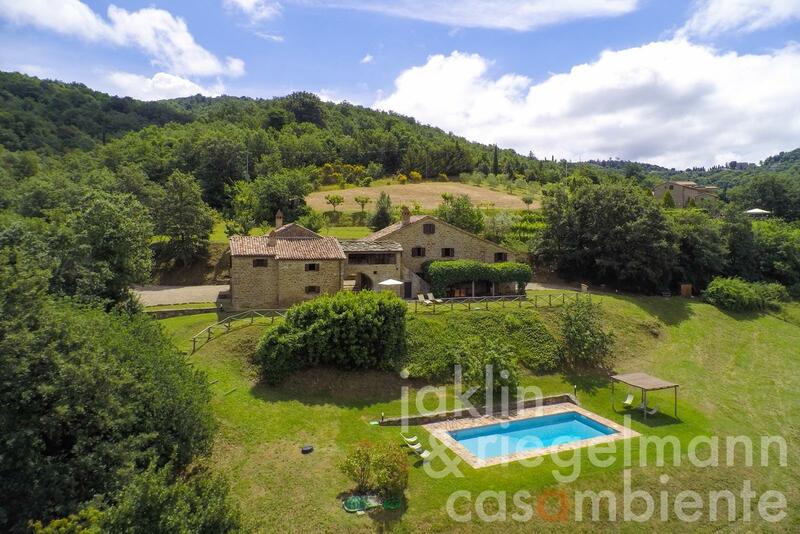 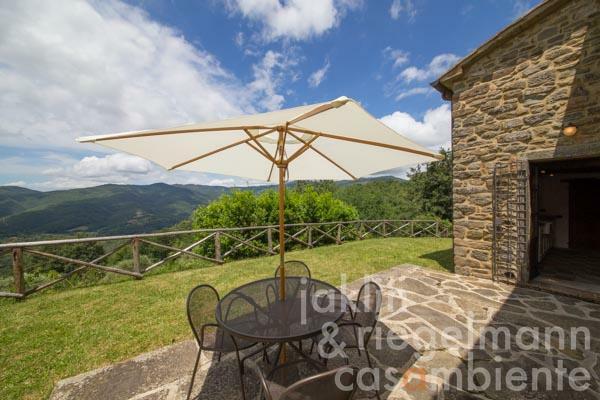 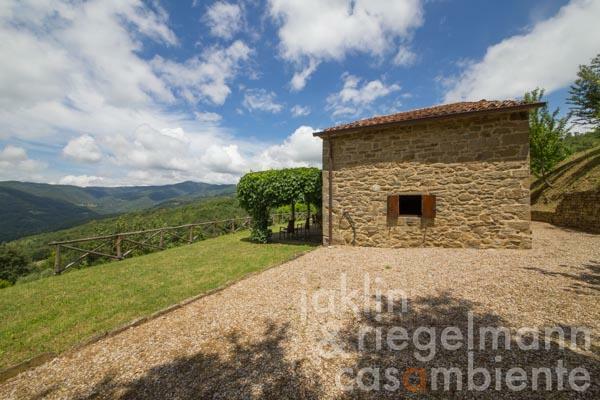 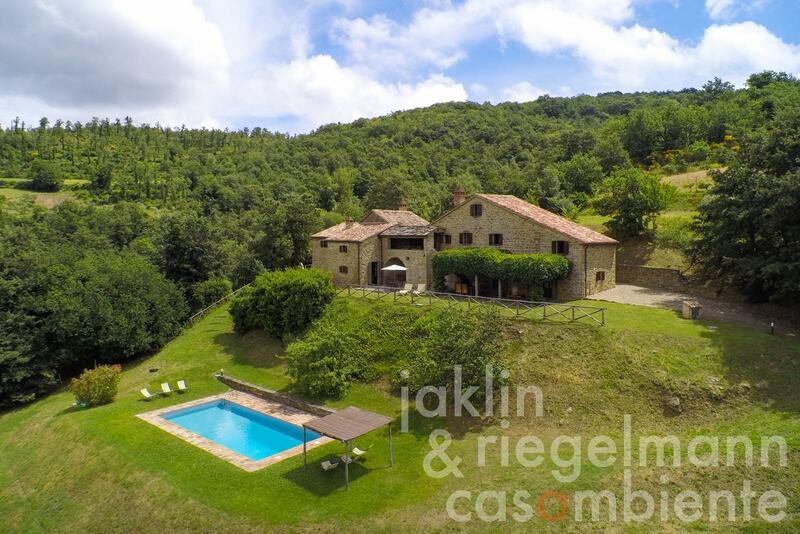 This property is an excellent base from which to explore both Tuscany and Umbria with many interesting towns, such as Montepulciano, Siena, Perugia, Città di Castello, Sansepolcro, Gubbio, Arezzo, Castiglion Fiorentino within easy reach. 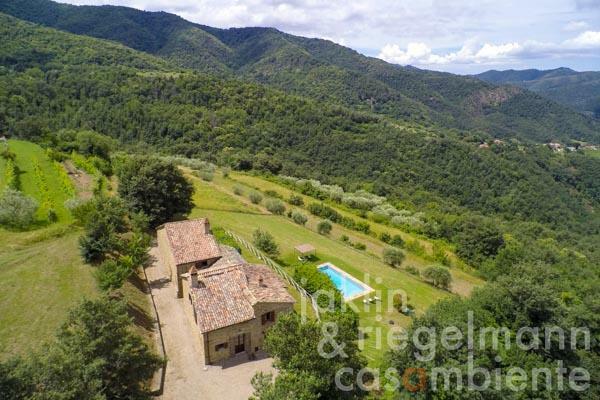 From Castiglion Fiorentino or Camucia, trains can be taken to Rome and Florence. Electricity, own well water, central heating, fireplace, gas tank, telephone, broadband internet access, satellite-TV, swimming pool, private parking, terrace, garden.